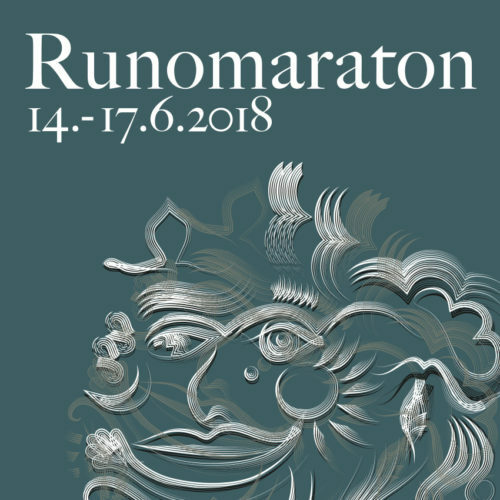 The main themes of the 19th Lahti Poetry Marathon are Estonia 100 and Risto Ahti. Estonian programme includes the poetry production based on Hasso Krull’s epic poetry collection “Meter and Demeter”. “VIRO 100: M&D” will take place on June 15 at 7 p.m. (Teatteri Vanha Juko, Rautatienkatu 13, Lahti). The performance features contemporary poetry, theatre, and music. The Krull’s epic “Meter and Demeter” handles global and eternal topics – birth and death, moment and eternity. The motifs of Estonian folklore, classical and aboriginal mythology are blended together. After the performance poet Hasso Krull and translator of the “Meter and Demeter”, Anu Laitila, will be interviewed by Heidi Iivari. On June 16, at 1.30 p.m., the performance “VIRO 100: SINNE MINNE” (Aleksanterinkatu 26, Kansantalo, Vaahterasali, Lahti) will take place. Kai Aareleid (Estonia), Silja Järvenausta (Finland) and Heidi Iivari (Finland) read poems accompanied by pianist Marge Loik (Estonia).